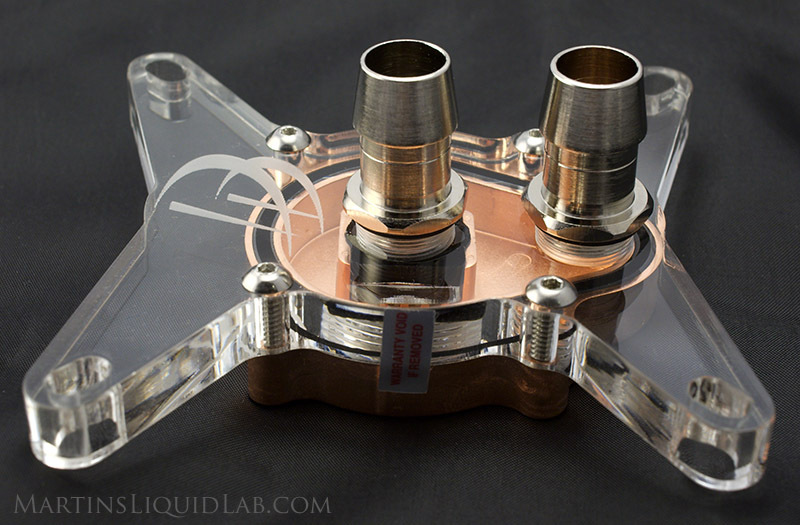 Welcome to my review of the Danger Den TDX CPU waterblock. 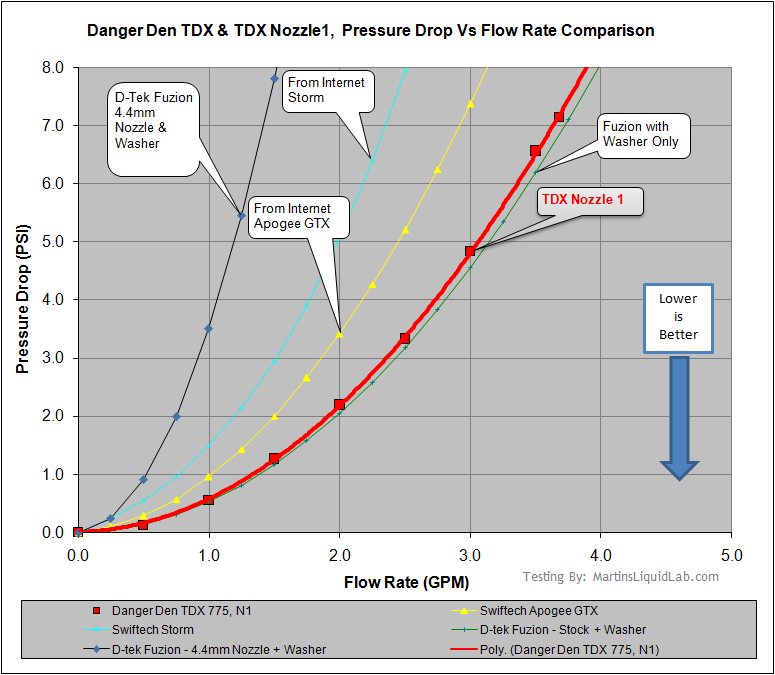 This is the Danger Den standard TDX model which is designed for single or dual core processors. 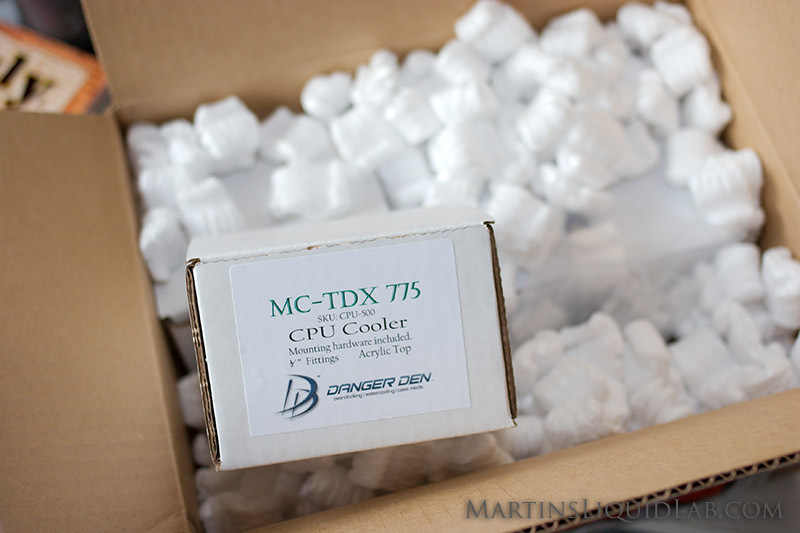 Danger Den's other model the MC-TDX is designed for dual or quad core processors. 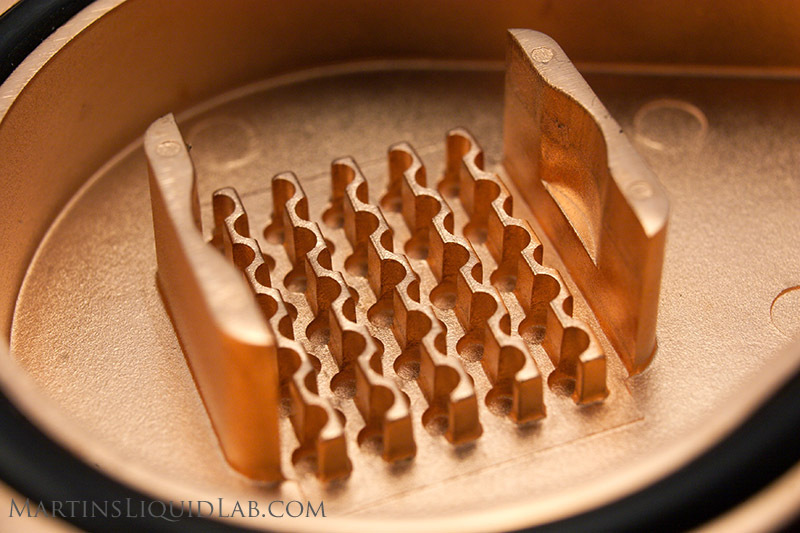 They both utilize the same type of casting construction and tops, but they have different pin matrix designs, coverage areas, and nozzle components. Let see more of this block and see how it does. Let's enjoy our typical "opening up a new present" moment and see what you get as part of the packaging. First off my box of Danger Den goodies arrived via FedEx in a well packaged box, and the delivery person even range my doorbell to hand deliver the package, that was a nice pleasant surprise! I received several products that were all boxed nicely in a standard box with packaging peanuts and it was professionally packaged box in a box style double protection. Threaded fitting ports are G 1/4 BSPP for use with any similar spec fittings. Anti-Tarnish coating applied to prevent tarnis from finger prints or environmental changes. This specialized formula also has no affect on cooling potential. All Copper - No aluminum or coated aluminum that can have galvanic corrosion, all materials are copper, brass, stainless steel, or lucite. Preassembled block and barbs - No waste in plastic barbs you won't use and perfect barb installation. 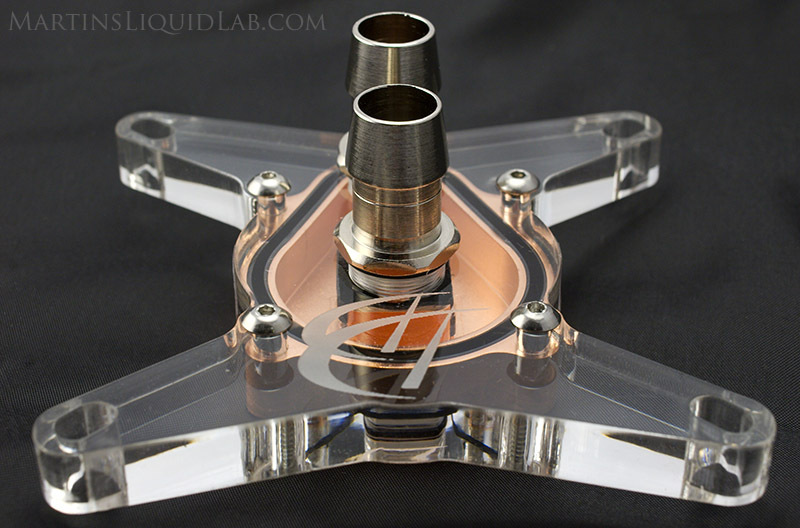 LGA 775 Only Custom top - Provides a more custom look, rather than a univeral hold down with many leftover holes. 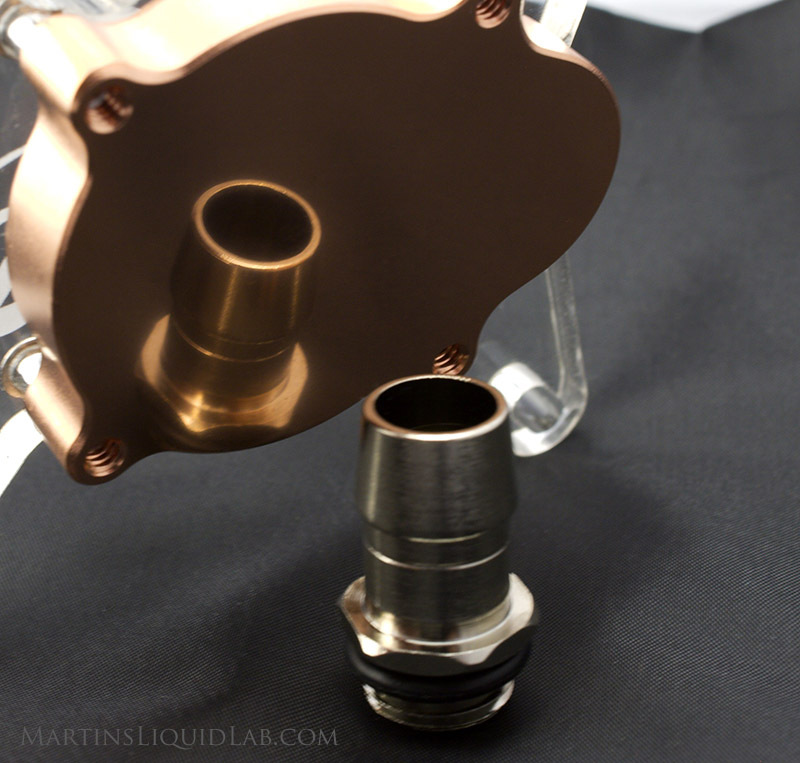 The Danger Den TDX CPU block is designed specifically to run a nozzle. 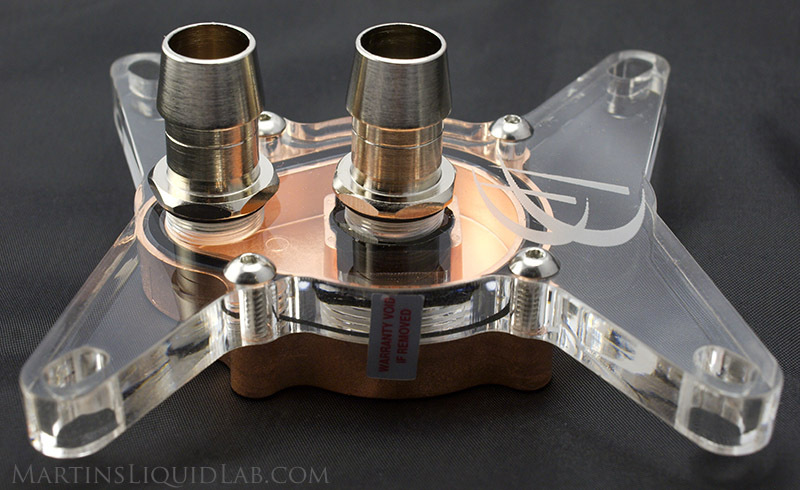 Water cooling and water block design is a careful balance of restriction vs thermal performance. While a completely open cavity block may have very little restriction, it's not going to perform very well. You need an adequate amount of heat transfer surface contact area, and you need high turbulence. 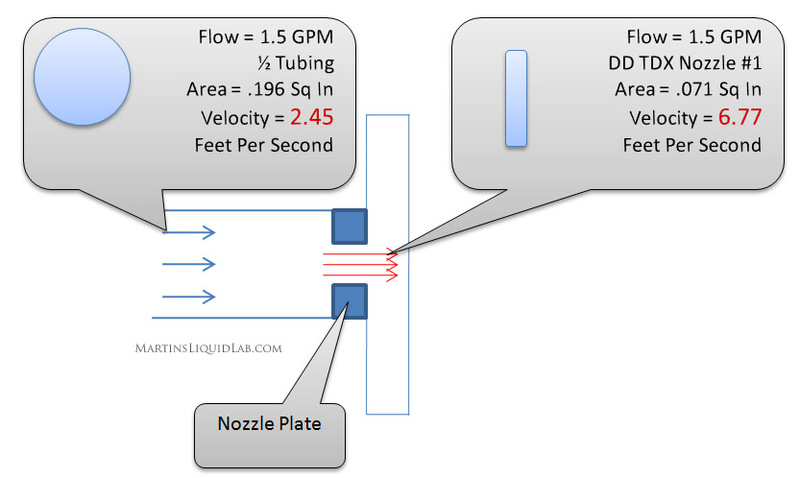 So as you can see the nozzle is producing a jet stream that is almost 3X the speed of the coolant in 1/2" tubing. This increased velocity improves the scrubbing effect of the waterblock base and floor as the stream of water crashes through the channels and impacts the internal floor of the water block where it is needed most. The nozzle plate also helps spread the flow more equally into each of the serpentine channels that are part of the TDX block. Finally this increased velocity provides turbulence or a mixing of the water in this critical area, this ensures that colder water molecules in the center of the jet stream have a better chance at coming into contact with the channel walls and absorbing heat generated by the base. Danger Den also has a TDX 5 nozzle kit available at thier site. One big advantage of a nozzle setup for waterblocks is the ability for the user to utilize different nozzles depending on the user needs. 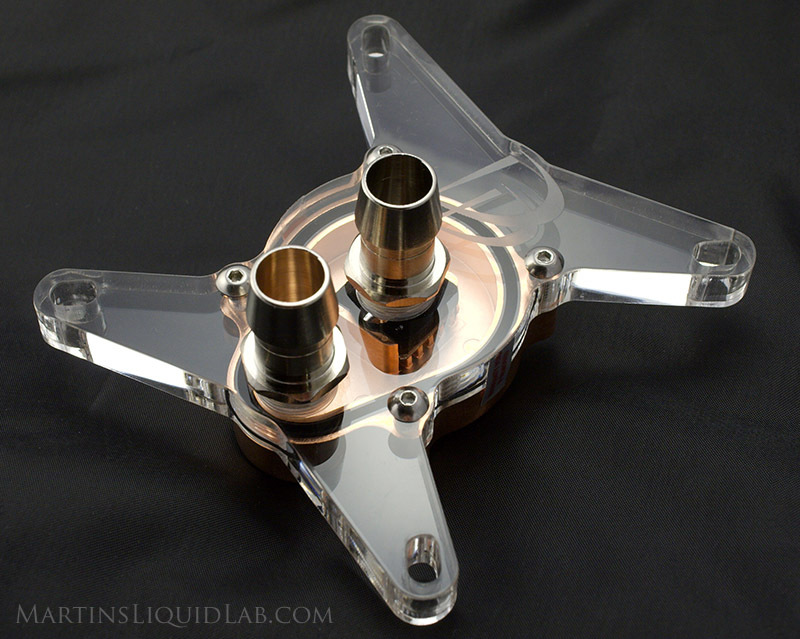 Depending on your particular pump, your particular CPU, and what else you may or may not be cooling in this same cooling loop, you may find one of the other nozzles to provide better performance than the standard nozzle #1. 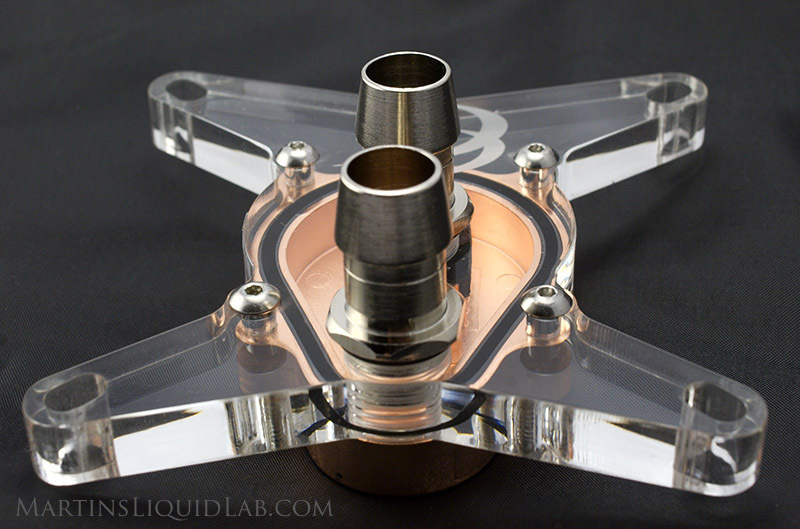 Danger Den provides 5 nozzles, 4 of which are premade, and 1 blank for you to design your own. Overall construction of the block and attention to detail is superb. The base is very finely cast from C110 copper and having seen some casting problems in past on other blocks, I was pleasantly suprise that I could not find any. The TDX utilizes a combination of chanels and drill hole dimples to create an array of serpentine channels so water will encounter changes in shape and cross section as it flows through these channels. The serpentine shape will mean more water will change directions and mix and impact the walls. To the right you can see a macro view of thes channel construction and note the nozzle holder wall on each side specifically designed to accomodate nozzles. The base bottom is very adequate in finish, you can see by the photo above in the gallery how it is a nicely finished base nearly a mirror in reflection and a straightedge test proved flatness to be excellent. It's fairly common knowledge that lapping a base much beyond 1000 grit no longer yields additional performance gains, so the specified 1200 grit is more than adequate. The top is fabricated of 3/8" (9.3mm) thickness acrylic sheet and is very precisely CNC machined and the edges are nicely finished. Some folks may not prefer the use of Acrylic (Lucite) due to durability concerns. Fortunately for you all metal block-heads out there, Danger Den has produced the same top in a brass option for you to choose from and it's at a very reasonable price. Go for a brass top if you want that added durability. The barbs are nickel plated brass, (no flimsy cheap plastic barbs here!). Using my digital calipers the inside diameter is a heavy 10.15mm, that's as bored out as it gets for G1/4 threading. The barbs have all been installed and the block pressure tested at 85psi, so no worries about leaks, you shouldn't have to touch these barbs, they come preinstalled and pressure tested. On some of my other blocks that came with plastic barbs, I had a hard time getting tubing back off of them and getting tubing onto them without the barbs turning on me, brass barbs don't have that problem. Danger Den has also sent me some samples of their new barbs they plan on incorporating that are a fantastic compliment and significant improvement over the ones shown in the above photos. See the new barbs on my review page here. The block screws as previously noted are a stainless round-head type screw that appears to be a nice 6-32 screw dimension and the head itself receive a standard 2mm allen head. All of the remaining mounting hardware appears to be in good order, nice larger brass thumbscrews and the necessary studs, springs, nuts and washers and appear to be in the 4-40 threading form. The block is very nice to look at with a high level attention to detal. Perhaps it's due to the transparent top, or perhaps it's the design of the copper mini pin matrix base and all that surface area for heat conductivity. I also appreciate the integrated hold down and top. A personal preference of mine is to have a top that looks custom. The block exceed my expectations in this area, but I encourage you to look more at the pictures and decide for yourself. 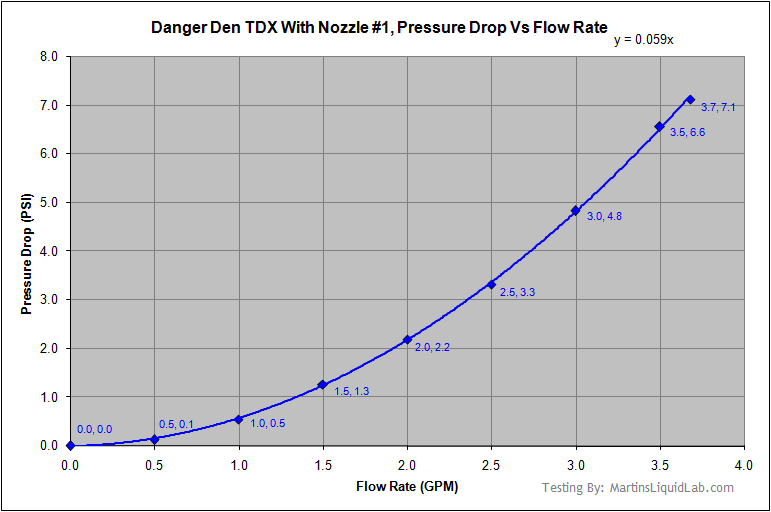 Therefore overall pressure drop on Danger Den's TDX is VERY GOOD in general and EXCEPTIONAL for a nozzled block! The TDX and nozzle #1 is not very restrictive at all and would do well in multiple block loops where too much CPU restriction could affect performance of other blocks. You can see just how much lower the pressure drop is than a D-Tek Fuzion with a 4.4mm nozzle and washer. Very impressive pressure drop for a nozzled block! The installation on the 680i was not a problem at all. I actually preferred the larger 6-32 threading of the TDX kit over my previous 4-40 bolts from my D-Tek Fuzion kit. Very basic and straightforward installation. To provide some sort of recommending criteria, I'm establishing the following with a 0-10 scale of excellence. Materials 10 Multiple top options make this a 10. Pressure Drop 10 The NEW KING of Nozzled CPU blocks! So far so good, just need to do some thermal testing to wrap this up..